.... J.R.R. Tolkien felt anxiety about whether his work would ever be completed or published. A short story called “Leaf by Niggle” gives a glimpse. The titular character, Niggle, spends his life painting a picture of a tree, but he departs on a “journey,” leaving the picture unfinished, knowing that officials will use the canvas to patch a leaking roof. When the discouraged Niggle finally reaches a land meant to symbolize heaven, he is distressed by his lack of accomplishment. But then he looks up. Before him stood the Tree, his Tree, finished. If you could say that of a Tree that was alive, its leaves opening, its branches growing and bending in the wind that Niggle had so often felt or guessed, and had so often failed to catch. 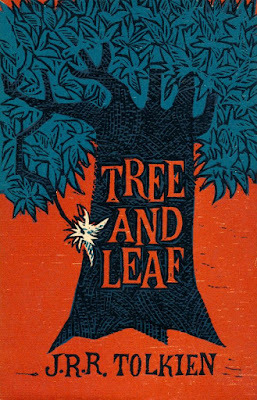 ....All the leaves he had ever laboured at were there, as he had imagined them rather than as he had made them; and there were others that had only budded in his mind, and many that might have budded, if only he had had time. Tolkien meant to capture the grace that grants completion and fulfillment to all of life’s wasted and half-finished undertakings. Unwittingly, he also prophesied the efforts of his youngest son. For without Christopher, we could never have beheld the sheer scope and wonder of his father’s achievement. Tolkien always saw The Lord of the Rings and The Silmarillion as “one long Saga of the Jewels and the Rings.” Christopher’s work, now finished, has brought the entirety of this myth, the culmination of a countercultural literary movement, a great tree “growing and bending in the wind,” into the clear, unbroken light. Tree and Leaf includes Tolkien's essay "On Fairy-Stories" (pdf here) and the short story "Leaf by Niggle" (full text). "A new birth of freedom"
"Divine love can reverse human catastrophe"
"Those who hear will live"
"No God: no law. No law: no morals"